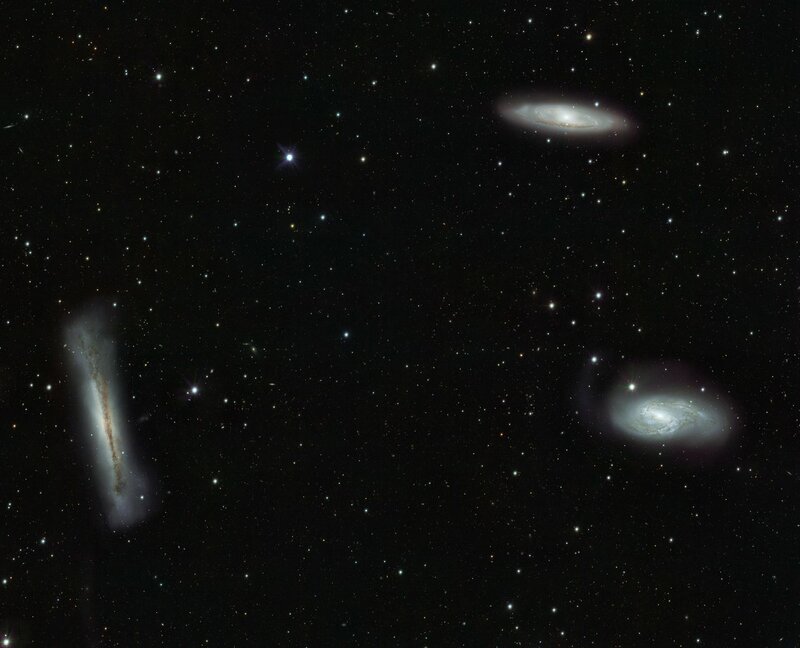 A huge image, from the new VLT Survey Telescope (VST) and its camera OmegaCAM at ESO's Paranal Observatory, shows a triplet of bright galaxies in the constellation of Leo (The Lion). But the faint objects in the background, rather than the foreground galaxies, are what may capture an astronomer’s attention. 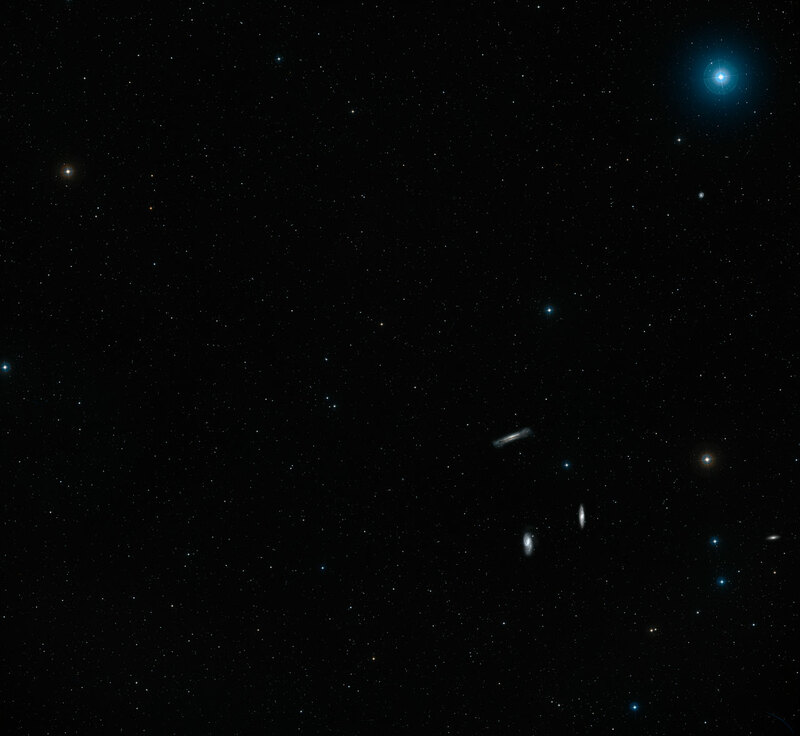 The VST’s sharp view of these dim objects hints at the power of the telescope and OmegaCAM for mapping the distant Universe. The VST  is the newest addition to ESO’s Paranal Observatory (eso1119). It is a state-of-the-art 2.6-metre telescope, which is equipped with a giant 268-megapixel camera, OmegaCAM . As the name indicates, the VST is dedicated to surveying the skies in visible light, and it is the largest telescope in the world designed exclusively for this purpose. This large view of the Leo Triplet demonstrates the excellent quality of images produced by the VST and its camera. The Leo Triplet is a magnificent group of interacting galaxies about 35 million light-years from Earth. All three of them are spirals like our own Milky Way galaxy, even though this may not be immediately obvious in this image because their discs are tilted at different angles to our line of sight. NGC 3628, at the left of the frame, is seen edge-on, with thick dust lanes along the plane of the galaxy. 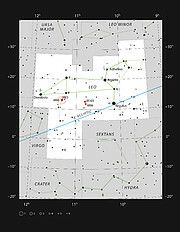 The Messier objects M 65 (upper right) and M 66 (lower right), on the other hand, are inclined enough to make their spiral arms visible. Large telescopes can normally study only one of these galaxies at a time (see for example potw1026a and eso0338c), but the VST field of view — twice as broad as the full Moon — is wide enough to frame all three members of the group in a single picture. The VST also brings to light large numbers of fainter and more distant galaxies, seen as smudges in the background of this image. In the foreground of the new image many point-like stars of varied brightness, lying in our own galaxy, can also be seen. One of the science goals of the VST is to search for much fainter objects in the Milky Way, such as brown dwarf stars, planets, neutron stars and black holes. These are thought to permeate the halo of our galaxy but are often too dim to be detected directly even by large telescopes. 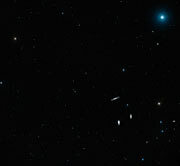 The VST will look for subtle events, produced by a phenomenon called microlensing , to detect these very elusive objects indirectly and study the galactic halo. Through these studies, the VST is expected to further our understanding of dark matter, which is thought to be the largest constituent of the galactic halo. Clues on the nature of this substance, as well as on the nature of dark energy, are also expected to be found through the VST’s surveys of the distant Universe. The telescope will discover distant galaxy clusters and high-redshift quasars that will help astronomers understand the early Universe and find answers to long-standing questions in cosmology. Very much closer to home, this image also contains the tracks of several asteroids within the Solar System that have moved across the images during the exposures. These show up as short coloured lines  and at least ten can be seen in this picture. 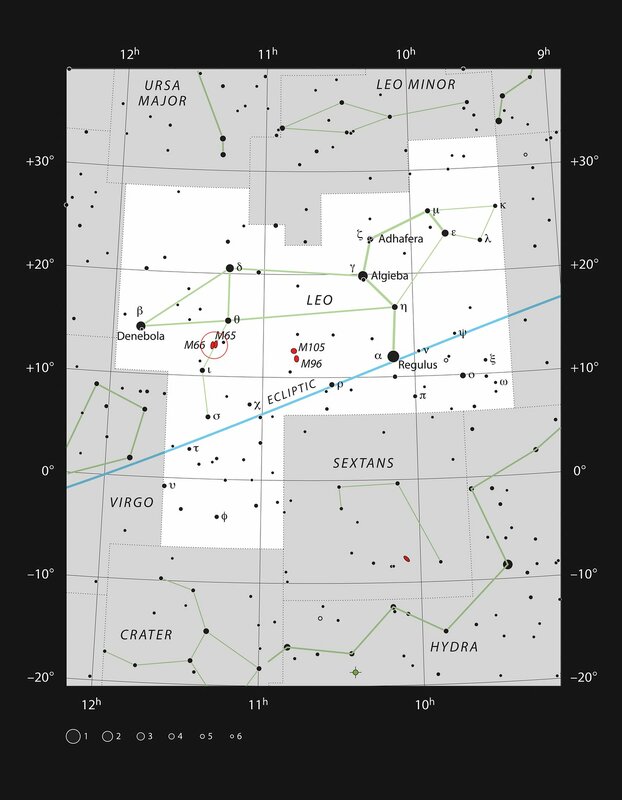 As Leo is a zodiacal constellation, lying in the plane of the Solar System, the number of asteroids is particularly high. This image is a composite created by combining exposures taken through three different filters. Light that passed through a near-infrared filter was coloured red, light in the red part of the spectrum is coloured green, and green light is coloured blue. The VST programme is a joint venture between the INAF–Osservatorio Astronomico di Capodimonte, Naples, Italy and ESO. OmegaCAM was designed and built by a consortium including institutes in the Netherlands, Germany and Italy with major contributions from ESO. Microlensing is a gravitational lensing phenomenon by which the presence of a dim but massive object can be inferred from the effect of its gravity on light coming from a more distant star. If, due to a chance alignment, the dim object passes sufficiently close to our line of sight to the more distant star, its gravitational field bends the light coming from the background star. This can lead to a measurable increase in the background star’s brightness. As microlensing events rely on rare chance alignments, they are usually found by large surveys that can observe great numbers of potential background stars. These are either green or pairs of magenta/red trails. This is because the exposures used to make the green channel of the final colour image were taken on a different night to those used for the red and blue, which were taken in sequence on the same night.